Joy Veg Fruit Dining just oozes sophistication and class. 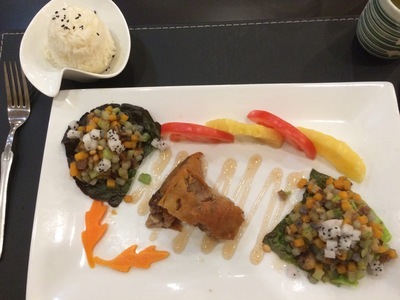 If you are looking for a quiet, romantic setting, with delicious vegetarian food and great service, then Joy Veg Fruit Dining may be the place for you. The presentation of the restaurant was quite impressive. It was spacious, yet had this feel of intimacy about it. The place was embellished with beautiful flowers and plants, and soft music played in the background. It was a simple restaurant, yet pretty and well maintained. 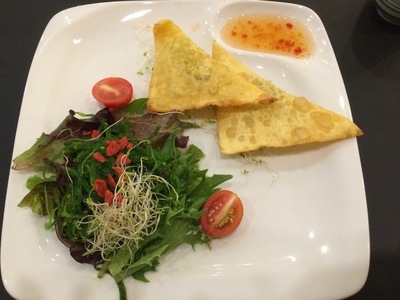 According to the introductory statement on the menu, the menu is changed monthly, which is great for customers as there is always new fresh, innovative meals to try. Joy Veg is a wholly vegetarian restaurant that prides itself on delivering a sustainable and cruelty-free dining experience. The menu offered a six, five and four course meal as well as single dishes. For my first experience here, we had the four course meal which came to $28 per person. 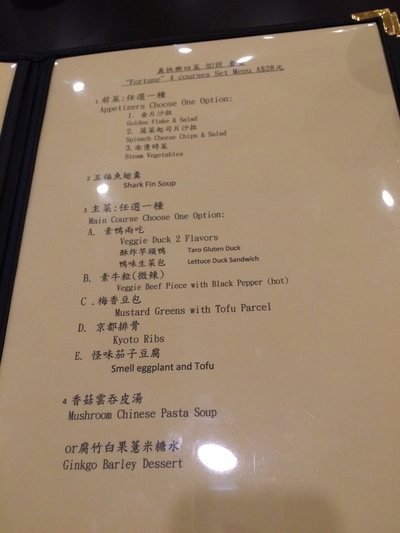 In this course, we had a choice of appetiser, main meal and a final course, alongside shark fin soup. Steamed vegetables - well done, but nothing special. I chose steamed vegetables as my appetiser. It was a simple dish that was cooked well, but was nothing particularly special as the vegetables were quite bland on their own and really needed the sauce to give them flavour. Another appetiser choice was the spinach cheese chips and salad. The salad was peppery, but fresh, while the spinach chips were warm and tasty. Vegetarian version of shark fin soup. Shark fin soup is a dish I haven’t had in more than six years, so I was really looking forward to trying the vegetarian version of it. Like with the steamed vegetables, the soup was quite bland on its own, but by adding in vinegar, it really transformed the dish into a flavoursome and delicious one. 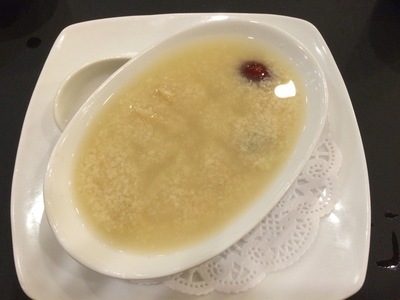 The broth was thick and slid down your throat, while the additional ingredients, such as the Chinese mushrooms, added some texture to the soup. Veggie beef with black pepper. I am not really a fan of fake or imitation meat, however I decided to give it a go with the main. The main meal that I chose was the Veggie beef with black pepper (hot). Despite the name, this dish was not hot at all, however it was still very tasty. It came with a little bowl of rice, cucumber, tomato, lettuce and cherry tomatoes. These fresh elements made a flavourful combination with the veggie beef. Other main meal options included duck prepared in an assortment of ways as well as the mustard greens with tofu parcel. The veggie duck dish had some really great flavours and was easily the highlight of the meal. The taro gluten duck had a strong taro flavour that went well with the veggie duck, while the lettuce duck sandwich was a concoction of celery, veggie duck, taro, and oddly, dragonfruit, that made for an interesting and delicious combination. Love the tofu parcel presentation. 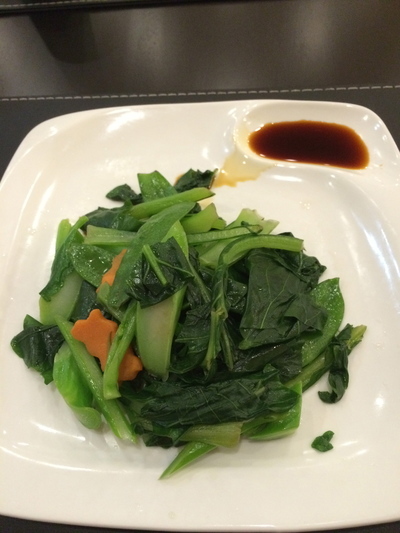 The mustard greens with tofu parcel was a bit too sweet for my liking. The sweetness of the sauce overpowered the dish, however, the tofu was well cooked and the presentation was faultless. The last course of the meal saw a choice between a Chinese mushroom pasta and a ginkgo barley dessert. I chose the ginkgo barley dessert which made for a great end to the four course meal - it was light, refreshing and subtly sweet. Subtly sweet - a great way to end the night. One of the highlights of the night was how well presented everything was; from the actual restaurant itself, to the main (and only) host of the evening and the food. It was all immaculate. Another highlight was the service. There was only one host who served every customer and he was so kind and friendly and made sure that you were satisfied throughout the entire evening. Extra points to him for managing several families at once; while taking orders, serving food and greeting customers simultaneously. There were also little things that made the experience a whole lot better such as pickled carrots as complimentary condiments at the start, and the handbag holder that was given to each customer with a bag so that you enjoy your meal without your bag getting in the way - it was a nice touch. Little touches that make a huge difference. Unfortunately, there were also some downsides to Joy Veg Fruit Dining, the main one being the slow service. As there was only one host and only one chef, the food was sometimes slow to come out - the wait between the soup course and the main meal was especially long. However, the food was definitely worth the wait. I'll definitely be back to Joy Veg Fruit Dining, I'll wait until the next menu comes out though to see what else they have to offer. Belmore, 2192 (parking via Allegra Avenue). When: Tuesday - Saturday 11.30am - 2.30pm and 5.30pm - 9.30pm.